Battle for lily pads by deploying, sabotaging and jumping frogs on an ever-changing pond of lily pads. It’s time to take control of the local pond. A game of Bullfrogs begins with one log and 4 lily pads in the pond. 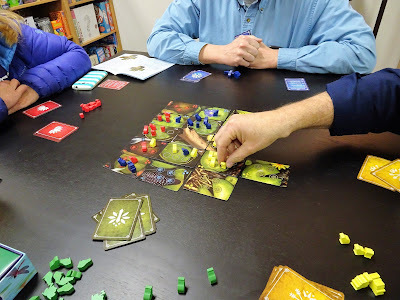 Each player starts with 10 lily pad cards to add to the pond along with 14 frogs and 2 Bullfrogs to take charge of as many lily pads as possible. A player’s turn consists of adding 1 lily pad from your hand to the pond and then adding 2, 3, or 4 frogs or Bullfrogs on lily pads depending on the lily pad added. Frogs and Bullfrogs must be placed on lily pads aligned horizontally or vertically with the lily pad just placed, but never directly on the placed lily pad. To secure the score of a lily pad a player must have the most frogs on the lily pad when it is filled up. Each lily pad can hold 3, 4, or 5 frogs/Bullfrogs. Bullfrogs count as 2 frogs. Once a lily pad is full the real game begins. The lily pad is removed to the winning player’s score pile. The winner then next jumps all of the frogs that occupied that lily pad to adjacent lily pads. That is 1 frog to each adjacent lily pad or the log. There is an order in which the frogs must jump. Opponents frogs must be moved first, then any opponents Bullfrogs, then their own frogs, and lastly their own Bullfrogs. Any frog with no lily pad or log to jump to is given back to their owner’s supply. Any Bullfrog with no lily pad or log to jump to is removed from the game. Frogs and Bullfrogs residing on the log must remain there for the remainder of the game. There is no limit on how many frogs and Bullfrogs the log can hold. Each frog on the log scores a victory point at game end. 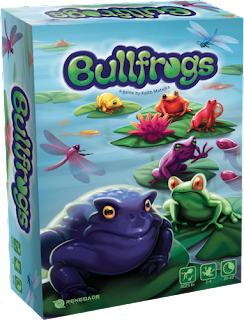 Each Bullfrog on the log scores 2 victory points and counts as 2 frogs to determine which player earns the 3 bonus points for having the most frogs on the log. The game ends when everyone has placed all of their lily pads in the pond. Each player tallies the points on the lily pads they have claimed. These points are added to the log points and the player with the most points becomes the head Bullfrog of the pond. 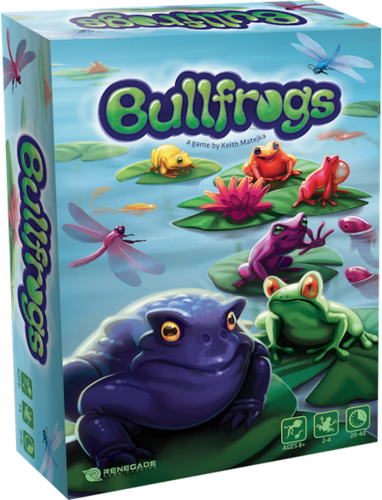 We have an open copy of Bullfrogs available in our Demo Games Library for you come in and try.